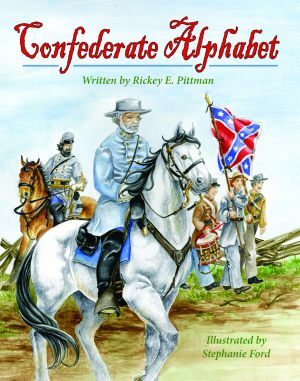 This educational alphabet book captures the confederate soldier’s experience during the War Between the States. Children will learn historical facts and about the spirit of the South and what inspired these men to fight for what they believed in. In the midst of war, soldiers and civilians alike found inspiration in simple things, such as the songs they sang and the food they ate. Young southerners will travel back in time with songs sung by the Confederates themselves. Lyrics to two popular period tunes are included and the book provides further information about terms such as “goober peas” (peanuts) and “vivandieres” (nurses of the Louisiana Zouave company). Rickey E. Pittman is a Civil War reenactor, public speaker on issues and topics related to the War Between the States, and musician who travels and performs original and Civil War-period music. His goal is to provide reading audiences with an “accurate book written from a Southern perspective” instead of “the politically driven and often historically inaccurate materials currently available on the Civil War.” Pittman is the author of Jim Limber Davis: A Black Orphan in the Confederate White House, Stonewall Jackson’s Black Sunday School, Stories of the Confederate South, Scottish Alphabet, and Irish Alphabet, all published by Pelican. Stephanie Ford has been involved in Civil War reenactments since she was a teenager. A high school art teacher, she is a member of the Society of Children’s Book Writers and Illustrators and the Twelfth Texas Artillery: Val Verde Battery. She lives with her husband and daughter on a farm in Texas. This is an excellent, patriotic, and inspiring book for any Southern family. Several of the illustrations are breath-taking and help reinforce the narrative of the book. A highly recommend it. This newest book of Rickey's is an outstanding reader for our children. It shows the true history of our land and at the same time teaches the fundimentals of reading. I will be getting several of these books for gifts this Christmas !!! !